Arrival in Saigon, formalities, transfer to the hotel. Free at leisure until time to dinner. Overnight at hotel in Ho Chi Minh. Lunch. Discover Cholon's Chinatown, including the Thien Hau pagoda, Oriental Medicine Street. Dinner cruise on the Saigon River. Overnight at hotel in Ho Chi Minh. Breakfast, departure for My Tho, a vast network of thousands of channels characterizes life in the Mekong Delta which covers 40 000 Km². Visit of a Caodaist temple. then boarding for a cruise in the Mekong Delta. Arrival on an island, tasting seasonal fruits that are harvested in the orchards. Visiting a candy factory with coconut, horse carriage riding in the village. Specialty lunch of the region: Elephant Earfish. Road to Can Tho, the largest economic city of the Delta. Dinner with tasting of a specialty of the Mekong Delta. Overnight at hotel in Can Tho. Breakfast, morning walk in sampan, small traditional boat to discover the floating market of Cai Rang. Discover the way of life of the South where the inhabitants of the region live and trade totally on the water. Back to Ho Chi Minh. Lunch at local restaurant located in the heart of a lotus garden. Arrival in Saigon, dinner and transfer to the train station for the night train to Danang (without accompanying the guide). Overnight in Train to Da Nang. Offered: A silk sleeping bag. Breakfast in basket. Welcome by your guide and transfer to Hoian, a small town classified as World Heritage by Unesco. Lunch and then walk in the ancient city of Hoi An, we note during the visit of Hoi An the perfect state of conservation of a large number of houses including the famous Tan Ky house. Visit the old parts of the city: the Fujian Shrine, Phuc Thanh Pagoda, Phuoc Kien Communal House, the old wooden houses and the Pagoda in Japanese bridge. Dinner and overnight at hotel in Hoi An. Breakfast. Boat trip on the Perfume River to Thien Mu Pagoda whose octagonal tower is recognizable from a distance. Visit of a royal tomb of the Nguyen dynasties with Tu Duc tomb. Lunch with tasting of Bun Bo Hue, "Hue noodles with beef", dish from the ancient imperial city. Stop in a village specialized in the manufacture of incense sticks, a craft specialty of the region. Discover the market of Dong Ba, specialty of the conical hat. Dinner at local restaurant and boarding the night train to Ha Noi (without accompanying the guide). Overnight in Train to Ha Noi. Breakfast. Early departure by road to Halong. Arrival around noon then embark on a cruise in Ha Long bay. This site has been a UNESCO World Heritage Site since 1994. Lunch of seafood on board. 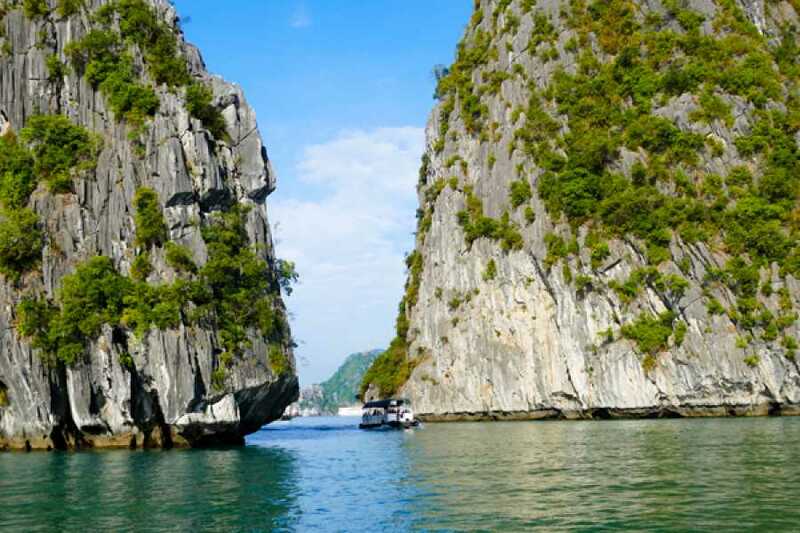 Stop in one of the natural caves to visit and admire Ha Long Bay with the grand view. Dinner and overnight at the hotel. Embark on a traditional boat to admire the spectacle of one of the most beautiful bays in the world, Ha Long Bay. 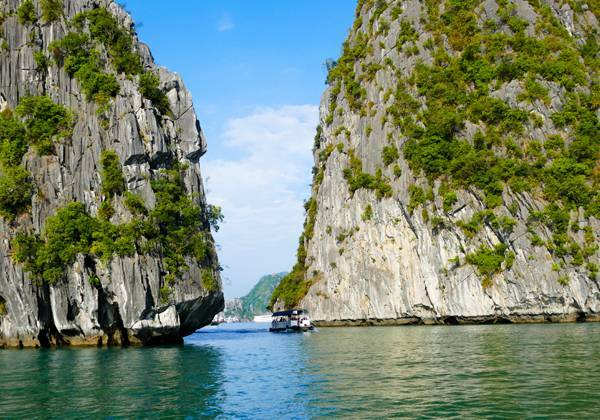 Discover the 2 days 1 nights itinerary cruising in Ha Long Bay. Overnight on board in Ha Long Bay. Breakfast. Free morning to stroll in the village of Halong. Enjoy your free tour with your own itinerary with Lunch and Dinner by your arrangement then transfer to the airport of Ha Noi for the your departure flight or to the city center of Hanoi for your next destination. End of service.